You can make a fashionable wardrobe staple with this cowl capelet free pattern and tutorial. This fashionable capelet can be made with an extra thick collar for warmth. This classic looking piece had and asymmetrical bottom and wonderfully over-sized collar. The pattern is fairly simple – an experienced sewer can make this under an hour easily. You will need to decide if you want to make a thick collar (double sided) or a thin collar (single sided). The thick collar is good for late fall early winter, it can be quite warm. For early fall I recommend using only 1 layer for the collar. On folded cloth cut 2 the main capelet. Then take the pattern and trim it down to the dotted line. Then take one of the pieced you just cut out and repin the pattern guide to it. then trim down to match. ou should now have one piece that it straight on top and one that has an inward curve. If you are cutting out a double sided collar cut 2 of front cowl (with curve). If you are making a single thickness collar just cut 1. Then trim pattern to dotted line and cut 2 for back cowl (double thickness) or 1 (single thickness). You should have 1 front piece of the capelet (with inward curve on top), One back piece (with straight line across the top). With right sides together pin the front and back sections of the main cape section together at the sides leaving the top and bottom open (pin and sew yellow on diagram). Then sew together using a .5 seam allowance along the sides. Set piece aside. Once you have sewn the two front pieces together and the two back pieces together its time to bring the whole collar together. 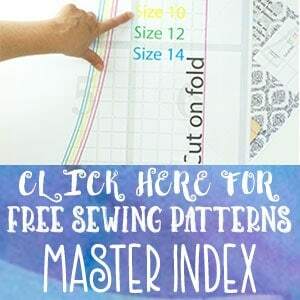 With right sides together Pin – matching up at the seam you just sewed. 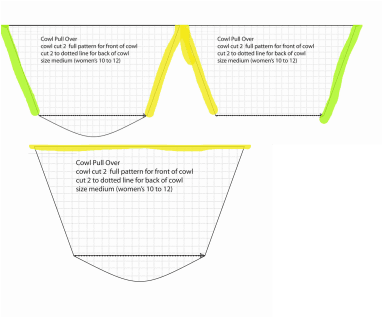 Sew the front to the back of the cowl (see yellow line in diagram to the right). then sew the other side (green line) with right sides together. This should make a large tube. Trim the bulkiest seam points (where they intersect) so cowl won’t be lumpy. Then fold cowl in half – along the first seam you made (the one at the top of the pattern piece at the widest part of the collar). Wrong sides together, matching the curved edges. Basically doubling over on itself. Now there should only be right sides facing out and the only raw edge is along the bottom of the collar. Baste the around the bottom of the collar using a .25 seam. 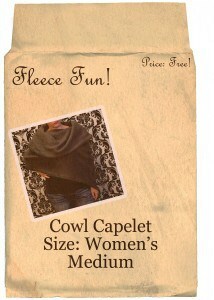 This will help keep everything smooth when you place the cowl on the capelet. For a collar with single thickness,with right sides together, sew the front and back cowl pieces to each other, using a .5 seam allowance. First the yellow line., then the green forming a tube. > You will attach the cowl to the capelet. 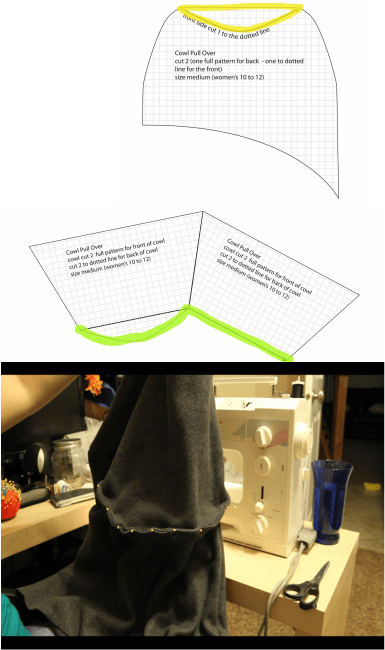 Optional – Last step turn under the bottom of the capelet .5 inches and sew using a a zig zag stitch along the edge of the fabric to finish off the bottom. Trim your threads and you’re finished! For some reason, I’ve been having a hard time downloading this pattern in a size large. Would you be able to email it to me? Your site is adorable….just found it tonight and it’s my new favorite. I plan on making some of the ruffled boutique pants and this capelet this weekend! I think there is a bit of code missing on the website for the large size–perhaps the <a before the link or the after the link? Thank you so much for all your amazing patterns and all your hard work. It’s very much appreciated. This one will make a great Christmas gift for my mom. having just had a mastectomy a week ago, I was very excited to see this pattern and downloaded it to find that it only came up to size 18. I know that I am not the only Plus size woman that would love this pattern. please consider adapting this to size 20-28 It would help so many to still be able to feel like a woman, and hide that fact that we no longer have our breasts. 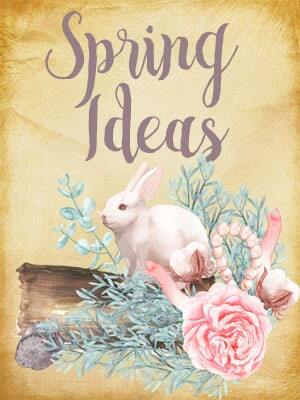 I love your blog, i was planning to make some dresses for my daughter. I have stitched some tunics. Can you give tips on how to finish the ends of fleece, what tension ,thread length is best for zigzag ? Because there are so many different sewing machines, me telling the tension, length for a zigzag isn’t going to help much. What I do recommend is taking a scrap piece of fleece and trying some variations of the stitch until you find one on your machine that makes you happy, is even on the top and bottom, and gives a clean stitch. 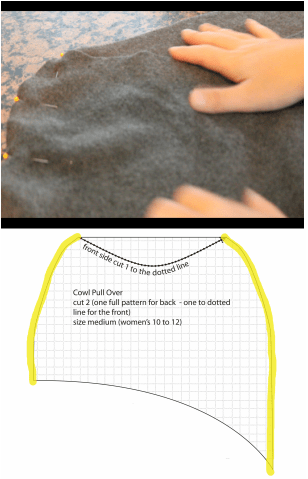 For finishing fleece I like to fold it under a half inch to an inch and sew a zigzag stitch along the edge. This gives a clean edge and keeps the fleece from stretching. i love this cape, and will soon try to make it. But I’m a large girl so i want to know where to ad if it is to small? You’ll keep the cowel and neck line the same – you’ll want to add to the poncho section. Thank you so much for the patterns. I am excited to start the fleece cape. One question: do I click on “download” button or the picture of the folders? I recently got a virus on my computer so I am just making sure the “download” button is safe. 🙂 Thank you!! !